Dolls as a child brought up during the nineties, I am quite well-versed in the world of Tetris. Much of my formative years were spent pounding away at the petite purple, gray, and black keyboard of my bulky, oversized, and downright unattractive original GameBoy system. As such, despite the fact that countless years have passed since I last indulged in the guilty pleasure known only as gaming, I have never been able to shake the vision of the tiny colorful block pieces falling gracefully into place upon the pitch black screen. Perhaps this is why I have fallen completely head over heels for the Alexander Wang Silk Tank. There is something quite elegant about racerback tanks which float over your form as opposed to encasing one in folds of constricting material which make you look and feel like a stuffed sausage; an ethereal quality to their design that takes on the role of sassy sophisticate when styled alongside ebony cigarette pants and sky-high stilettos, or a teeny tiny pair of faux leather shorts coupled with suede over the knee boots. 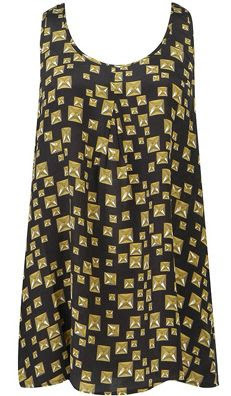 While intended to be adorned with a glimmering gold design reminiscent of roughhewn yet sublime savory studs, I cannot help but feel that the brilliant Alexander Wang’s Silk Tank is more of a subtle salutation to the gaming world, highlighting the fact that gamers need not adhere to geeky forms of dress when armed with a controller. Quite the contrary, in fact, they can be downright glamorous! But alas; the Silk Tank is not destined to be a part of my world, for I am neither gamer nor heiress, and at $265.00 apiece, one would most definitely have to be the latter to claim this charming top as her very own. Regardless, you know me quite well darlings; I am not a quitter. I shall forage on in the world of fashion without Alexander’s ambrosial bit by my side; but I will most certainly not be alone. I shall be accompanied by Forever 21’s Bejeweled Woven Tunic. Though lacking the sinewy silk texture; for a mere $22.80, the Bejeweled Woven Tunic is a tantalizing way to add a splash of Wang wonderment to your wardrobe, at a price that won’t wig out your struggling bank account! Tell me, lovelies...is it your day to be a big spender and spring for Silk, or are you determined to be thrifty and go for Woven? Alexander Wang is so young, I guess I grew up in the noughties... But you found a great alternative, Erika, and this time I would certainly be thrifty! You blog is so lovely. I came across you over the summer but stopped blogging for a few months to settle into college! You've inspired me to start again! I would love to go silk but woven may be what i can afford at the moment. I actually prefer the cut of Forever 21's better, so I'll cast my vote there! Girl, you're so good at find these super close knock-offs! Love it. The resemblance is shocking! Great find, darling! I do love the prints, love studs so much!! I loved Tetris as a kid so much. The Alexander Wang top is divine. Its so gorgeous, but I'm going to be a tightwad this week and opt fot the forever 21 version! I actually much prefer the Forever 21 tank. So pretty! I had to chuckle with glee at the mention of Tetris! How I loved that game back in the day :o) My vote goes to the silk print top! My, they do look very similar! I love how you found the correlation between the Wang top and tetris, I'm feeling a little nostalgic. I would go for the Forever 21 tank because sometimes, attitude and confidence makes a piece. That is a straight twin of the a. wang top. it's identical! Why even bother with the expensive stuff, right? Woah these are literally like the exact same top! How do find this stuff?? You are so amazing! I agree with Lenore. Those look so very similar. U have a good eyes, Erika! You really do have an eye for spotting a couture-inspired bargain! And I love tetris! so addicting. Oh how pretty! The pattern sort of reminds me of Tetris...one of my favorite games!! It's so cold here I can't even think about a tank top! You find the best stuff at f21. I get so freaked out in there sometimes...have you heard of the new one in Cerritos?! I keep hearing it's AMAZING and scary haha! I love tetris. I definately go with the Wang, I like the print a lot more. i loved carrie's outfit too, and i was actually surprised because i didn't expect a big fashion statement from her for some reason. haha, i can't help but think about tetris every time i look at that tunic now. Hi Erika, very interesting, the top pattern and Tetris... but you are so right, and a great post. Those tops are really stunning. Thanks for your kind words on my last post, you made my day...! Speaking of which, you certainly have a very special way with words, and I hope you consider becoming an author of fashion columns or maybe even your own novel... you have the talent. Have a lovely fashionable day! teehee ... before I even read your post, my first thought was "Heeeey... that looks like a Tetris screen!" Haha. I love both, but Heidi from The Hills wore the Wang! I love silk but hey,the Bejeweled woven tunic looks beautiful. oh how i love the 90s! i like the faux studs on the forever 21 tunic! lol I never played Tetris. Maybe my childhood was incomplete? F21 for me this time... maybe if it were a dress i'd splurge, but i wear casual separates so rarely its hard to justify a splurge! Both look great, but silk is so nice! Hope you are having a wonderful day, dear. Erika!! OMG!! IDENTICAL!!! seriously. wow. Silk is soooo luscious against the skin...so I vote for LUSH!! I heart racerbacks too!!!! I love the design on this one but would prefer a different color... Hmmm. The top is stunning, I like the texture if the silk fabrics. This is stunning shirt, it looks fabulous. A great alternative to the A. Wang tank top! And as much as I love silk, the woven material may actually be more practical, considering you can't wash designer silk (not even hand wash or dryclean). The bargain for sure!!! :) It looks like an elegant and still comfortable beautiful tank. Both are actually really cool... But I think Wang's silk is so much more chic. It really makes a difference. I say go for the Alexander Wang piece because it's silk! I wish I could go back to the 90's..in that silk tank. oh man I used to be SUCH a tetris addict. Such a cute top! I love it. Would pair with skinny jeans and thigh high boots for a night out. I would never think to buy that, but the more I look at it the more I like it! wow, the save version is a winner!